I am a PhD student using (at the moment), The Archive as a slip-box for literature notes and forum (seminars, lectures, workshops) notes. 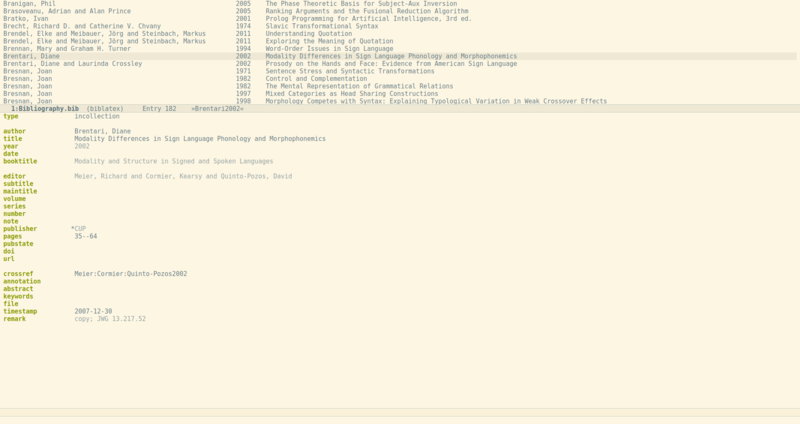 For academic writing, I have started to use Emacs (Kieran Healy’s social science setup). There I use Magit and GitHub as a version control system, and ebib as a reference management (I am storing all my references in various bibfiles (BibTeX syntax) in a single bibfile folder. The bibfiles are called thesis-article1.bib: thesis-article2.bib: thesis-kappa.bib, in order to keep a certain order of which references I use in which text. Furthermore, I have a folder called bibpdfs in which I store all pdfs (I can find) of the references I use. They are named in the following way: firstauthorlastnameYEARfirstwordinarticle. For example ahrens2017how.pdf. I would like to write notes in The Archive of the literature I read and to be able to include the metadata from the bibfiles in The Archive and also connect the zettels (one overarching structure note + about 15 notes/zettels per read article/book) with Emacs somehow, but I have not found out how this could be done. Would therefore be grateful for any advice that could help me out. I'd recommend to give us more detailed information about your setup. I think only a fraction of the users know about Kieran Healy’s social science setup. I certainly don't. You are right, @sfast. Sorry for not being so clear. I was referring to Kieran Healy's The Plain Person's Guide to Plain Text Social Science and Emacs Starter Kit for the Social Sciences. When speaking of Magit I meant this, and Ebib referred to this. Hope that my post became easier to understand now. Look forward to feedback. Interesting links, thanks for sharing! Side note, I use 1 literature .bib file for all my stuff. I do copy relevant things into project files when I compile LaTeX, because I don't want illegal BibTeX markup in a totally unrelated place mess with the project. I also name PDFs like the cite keys I use so I get both the .bib results and the PDFs with full-text Spotlight search. is writing notes in The Archive a problem? do you want to have a tip for putting the "metadata from the bibfiles" (Markdown reference definitions I presume)? What's the expected outcome of "connect the zettels [...] with Emacs somehow"? E.g. do you want to have clickable links in Emacs that lead to the note? Thanks for your input @ctietze! ???? When reading an article or attending a seminar I am taking notes on paper, from out of which I in The Archive create a structure note + 5-20 zettel notes with clickable links. Now, when I start writing an article (in markdown) in Emacs, I normally press c-x e to launch ebib and then automatically the bibfile I have chosen to be pre-loaded opens up and it looks like this. Here you can see that it is possible to associate a certain reference, lets say Brentari (that is shown here) with a ’Note’, ’Annotation’ and ’File’. Here I would like to be able to link my structure note, so that I will be able to open the structure note in an Emacs buffer. In that way, as I write my article, I can have easy access to it. And I would like then that the references I have used in The Archive when writing my notes, for example @andersson1985true, will be recognized by Emacs and Ebib so that if I used pandoc or Marked 2, the correct references would be exported and listed. In addition I would like, inside of Emacs, the zettelnotes links in the structure note ([]; [], etc.) to be clickable and possible to open in an Emacs buffer, (and the references recognized here as well). So, my question is basically, what method and syntax should I use in The Archive for my notes in order to be able to get The Archive and Emacs to work together in this way? Those initial question marks, should have been a smiley. I don’t know what happened. Sorry for the confusion. I'm not working with bibliography per se right now, but I have done a bunch of work trying to integrate emacs and The Archive. I recommend looking into deft and @EFLS 's excellent zetteldeft. I use the zd-search-at-point function in zetteldeft as a "link", because if you have point on a zk-style UID it will open all related links in deft. I've been experimenting with making a custom link style so that deft will respect an archive-style link, but honestly I have zd-search-at-point set to a hotkey with evil-leader and it's maybe better. Thanks for the advice @mediapathic! As for now I am thinking that the best option would maybe still be to keep the zettels in The Archive and my writing in Emacs separetely, and not mix them. After all, handling zettels in The Archive seems smoother and more intuitive compared to writing and editing them in Emacs, or what are your thoughts? Following this logic, the best thing would then be if I could just link to the zettel structure note (that includes my understanding of a certain text) in the field ’note’ in Ebib. (Here you can see which field of ebib I am talking about). I will ask the developer of Ebib about this. @mediapathic, are you, btw, using version control through magit in Emacs? Are your zettels under version control or do you just use a cloud service backup like Dropbox? Maybe being able to have version control of the zettels would be a reason for writing and editing them in Emacs, or what are your thoughts @mediapathic? I'm a bit of an outlier on this question, as I mostly write fiction, and so keeping my writing in the Zettel rarely makes sense ( see the discussion here. ) At the moment I use Emacs for both writing prose outside of the Zettel directory, and working in the Zettel using deft and zetteldeft, so for me the experience is fairly seamless, independent of directory structure. One thing I love about Emacs is that most of the time you can just sort of ignore the filesystem . I use magit for version control for my fiction, but I don't use it on my ZK directory. I don't see any reason one couldn't, it just doesn't seem to serve enough purpose for me to bother with the overhead. I keep my ZK on dropbox (along with the rest of my writing), and its history and syncing has been good enough, as I rarely care about things such as diff on a Zettel.